The Manila Science High School (MSHS), the premier Science High School of the city of Manila has dispelled the unfounded alarms about the supposed mercury spill that supposedly affected students and members of the faculty last March 18, 2017. 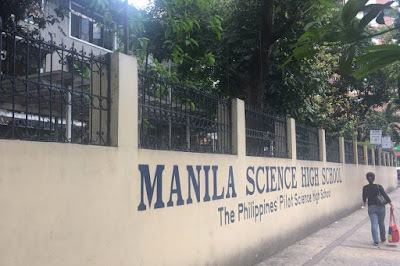 Unlike what was erroneously reported, there were no chemical leakages in the laboratory at the 2nd floor of the school building. Instead, a Charles’ Law apparatus inadvertently spilled several non-toxic chemicals I the laboratory. This was according to the MSHS principal Ms. Eva Nacion. The school’s science teachers immediately cleaned the spill since these teachers were trained and are proficient in handling chemicals. Thorough inspection were made the teachers concerned and was duly reported to Ms. Nacion the following day. The teachers were then asked about their condition. The area was then isolated on March 20, 2017. A third party firm, Globecare that specializes in hazard materials handling and cleaning were then brought in to conduct cleanup services at the MSHS. The students and faculty who were exposed to the chemicals showed negative signs of difficulty in breathing and dizziness. A teacher was admitted to the Philippine General Hospital (PGH) but was not confined contrary to earlier reports. In an effort to ensure the safety of students and faculty of the MSHS, the Department of Education (DepEd) announced this morning March 25, 2017 that the East Avenue Medical Center (EAMC) a government tertiary hospital and the Manila Health Office will conduct screening tests for MSHS students and faculty members. Reprts are still being awaited from Globecare, the Department of Health and the Manila Disaster Risk Reduction and Management Office that earlier managed the response and management of such incidents that is in accordance with its mandate..